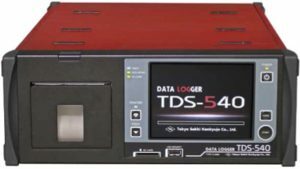 The TDS-540 is a new data logger from TML, incorporating every function required for static strain measurement. It accepts strain gauges, strain gauge type transducers, dc voltage, thermocouples and Pt-RTDs as inputs. The unique measurement technique enables highly stable and accurate measurement by eliminating the effects of various thermoelectromotive forces, thermal zero shift of amplifier and power line noise. Strain measurement of up to 1000 channels is possible in 0.4 seconds by combining with optional high-speed external switching boxes, and a high-resolution mode of 0.1 microstrain is also possible. It is equipped with a newly developed remote data logger function which makes remote control possible through an internet browser and an optional wireless LAN allows measurement and monitoring of the data logger using a tablet terminal or smartphone. Other standard interfaces are Ethernet LAN, USB and RS-232C. You can easily configure a new strain measurement system according to your measurement needs with the TDS-540, and the onboard colour LCD with touch panel offers excellent intuitive operation. Often used functions are arranged in upper hierarchies, the input procedure for interval timer measurement has been simplified, and the sensor ID setting display has been improved to offer easy operation. A secure internal memory device is provided for backup of measurement data in case of SD card failure and an uninterruptible power supply circuit is provided for holding measurement data during unexpected power failure. The TDS-540 is equipped with a built-in switching box unit of 10 channels as standard and the number of internal units is expandable to 20 or 30 channels as a factory installed option, while using external switching boxes up to 1000 channels may be logged. The size of the unit is 320(W) × 130(H) × 440(D) mm, and it weighs approximately 8 kg with the standard 10 channel built-in switching box. For further information please ask for a data sheet, or send us details of your application.